The Gallipoli Landing of 25 April 1915 is arguably Australia’s best known battle. It is commemorated each year with a national holiday, services, parades and great media attention. 2015, the centenary of the Gallipoli Campaign, was marked by great publicity and the release of many books, articles, films, documentaries and television series. Despite this attention, the Landing is still a poorly understood battle, with the historiography coloured by a century of misinformation, assumption, folklore and legend. 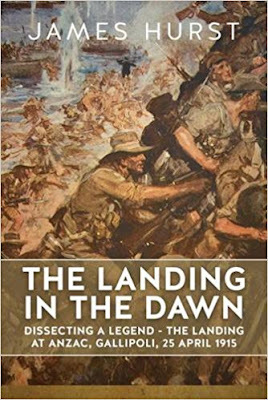 The Landing in the Dawn: Dissecting a Legend – The Landing at Anzac, Gallipoli, 25 April 1915, re-examines and reconstructs the Anzac Landing by applying a new approach to an old topic – it uses the aggregate experience of a single, first-wave battalion over a single day, primarily through the investigation of veteran’s letters and diaries, to create a body of evidence with which to construct a history of the battle. This approach might be expected to shed light on these men’s experiences only, but their accounts surprisingly divulge sufficient detail to allow an unprecedented reconstruction and re-examination of the battle. Thus it effectively places much of the battlefield under a microscope. The use of veterans’ accounts to re-tell the story of the Landing is not new. Anecdotes have for many years been layered over the known history, established in C.E.W. Bean, Official History of Australia in the War: The Story of ANZAC, Volume I, to cover the existing narrative. Here, detail extracted from an unprecedented range of primary and secondary sources, is used to reconstruct the history of the day, elevating participants’ accounts from anecdote to eye-witness testimony. This shift in the way evidence is used to reinterpret the day, rather than simply painting it into the existing canvas, changes the way the battle is perceived. Even though more than 100 years have passed since the Landing, and well over 1,000 books have been written about the campaign, much can be learned by returning to the “primary source, the soldier.” The Landing has not been previously studied at this level of detail. This work complements Bean’s by providing new evidence and digging deeper than Bean had the opportunity to do. It potentially re-writes the history of the Landing. This is not an exclusive Australian story – for example, one third of the battalion examined were born in the British Isles. This volume, the most current and comprehensive study since Bean’s, has been rightly described as a major contribution that will change the way the legendary amphibious landing is viewed.